Creating a setup for fault injection or side channel testing on an embedded device can be daunting. 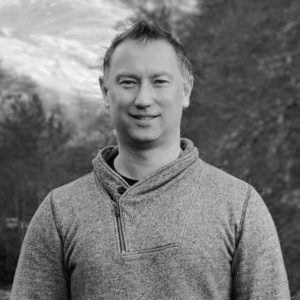 Executing functions, warm or cold resetting, glitching, maintaining a certain program flow are all non-trivial target device related activities which all offers challenges for the user. The Spider is a generic workbench to interact with (complex) embedded targets. It reduces set-up complexity in Side Channel Analysis (SCA) and Fault Injection (FI) by creating a single control point with all the I/O and reset lines for custom or embedded interfaces. It can be controlled from the Inspector software or as stand-alone device. The Spider can read and respond to signals associated with protocols like JTAG, I2C, SPI, and thus provides an information channel to the internal processing state of targeted hardware. Example protocols are included. Spider is also used for fault injection glitch generation for embedded targets. With Spider you can generate arbitrary glitch waves with 4 ns time resolution. The shape of the glitch waves can have any slope which allows for very specific testing of embedded chipsets. Longer glitch waves with a specific slope often stretch the robustness of a chipset. Custom glitch shapes allow for adjusting the output voltage, timing (including parameters such as offset), repetition rate/frequency and duration of the pulse. Lasers and EM-FI transient: Spider triggers and sets power levels. Glitch Amplifier or High Power Glitch Amplifier: Spider generates arbitrary glitch waves with 4 ns time resolution. 50Ω adapters are needed for Spider to interface with Glitch Amplifier and High Power Glitch Amplifier. icWaves: Spider sets digital inputs and receives trigger signals. 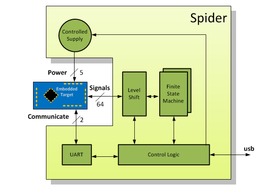 Embedded processor: Spider communicates to processor, sniffs communication between processor and peripheral, triggers, resets (warm or cold) and receives digital signals from processor. Other proprietary hardware: Spider interfaces via 64 GPIO pins, 6 analog voltage outputs, 2 glitch outputs or 2 UARTS. PC running Inspector or proprietary software via the SDK. Although Spider’s web may consist of several hardware components, the total number of components is still far less compared to when all of Spiders functions would be handled by separate hardware components. 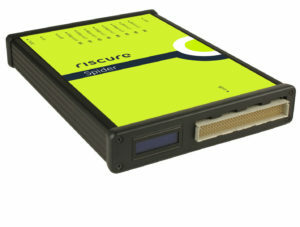 Please contact your nearest Riscure sales representative or email us at inforequest@riscure.com for a detailed specification.